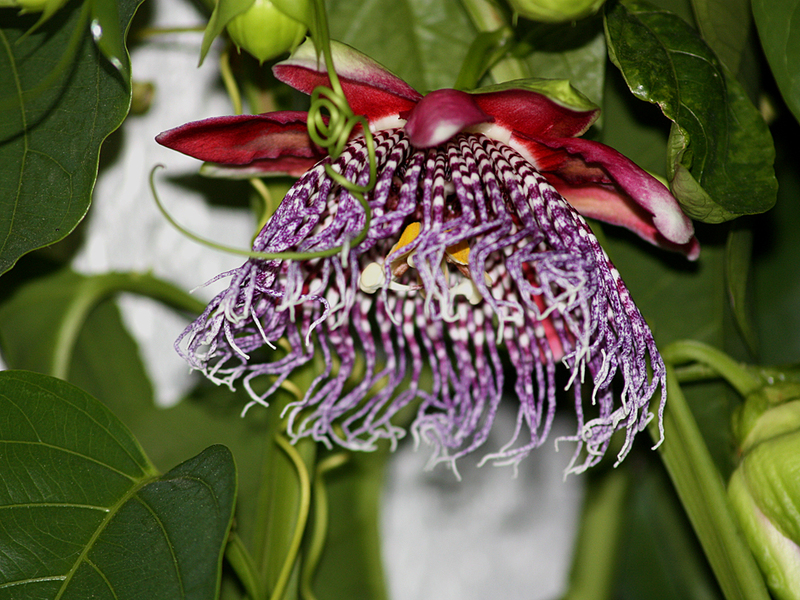 Passiflora alata – quite like Passiflora quadrangularis but smaller flowers. A very variable species. 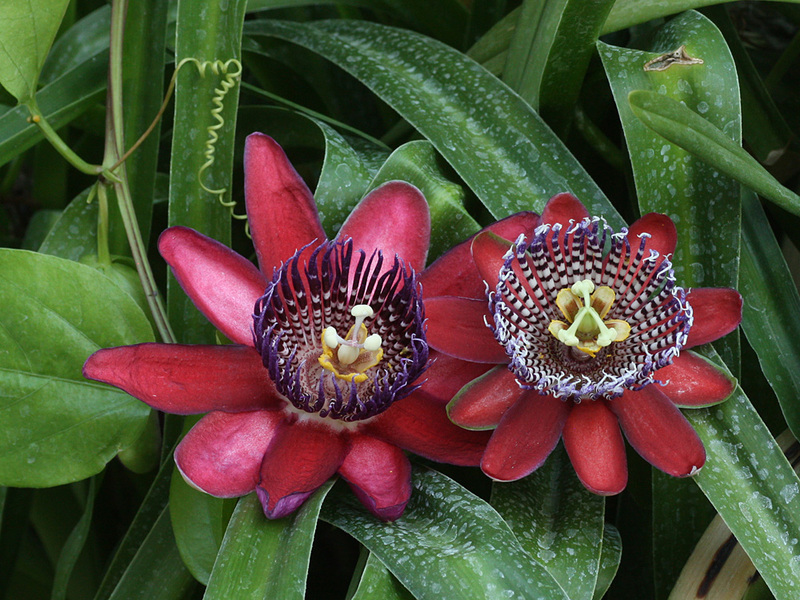 Flowers 10-12cm wide with neat corona filaments. Sepals and petals red inside & green out. 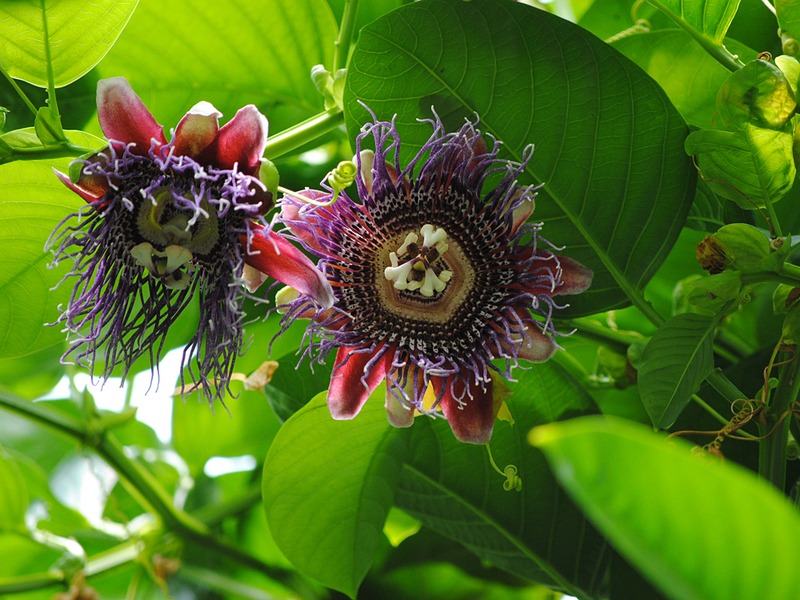 Fruit ovoid, 10-15cm long by 5-10cm wide, bright orange or yellow when ripe. 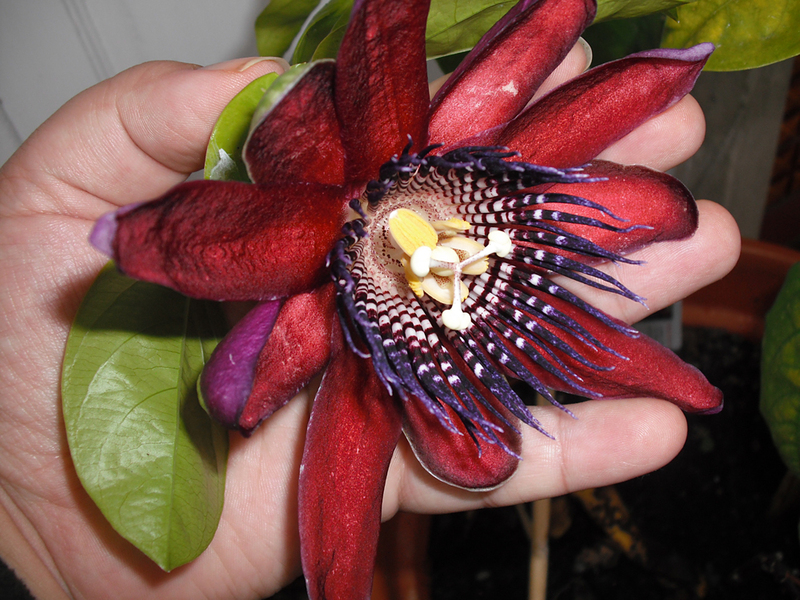 (Passiflora alata x Passiflora quadrangularis) often mislabelled and sold as P. quadrangularis. There are a number of clones of this cross. Square stemmed. 4 glands on 90% of the petioles. Stipules 15mm long by 6mm wide. Large ovate leaves. Heavy flowers 10-13cm, corona filaments a bit scruffy at the end compared with alata. Sepals and petals red inside & sepals green out & petals red out. Fruit egg shaped up to 18cm long, dull orange when ripe. Square stemmed. 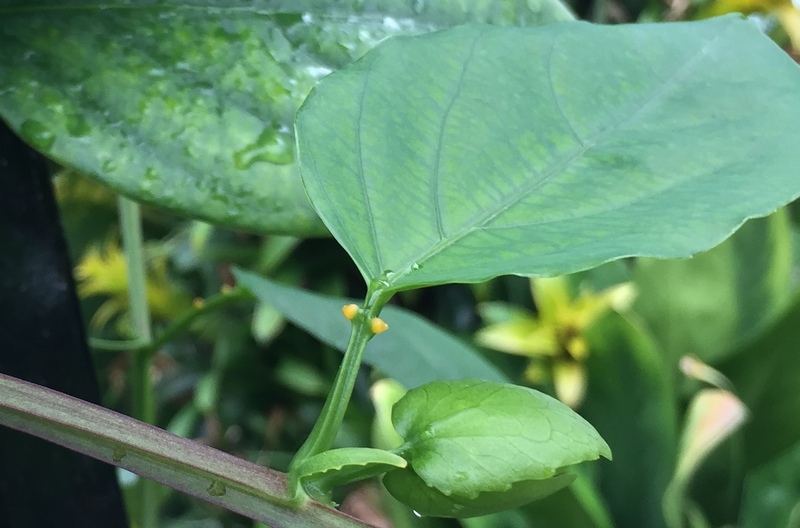 2 bright yellow petiole glands on the petiole, as below, near the leaf make ID easy. Especially obvious on new foliage. Coloraturas fades on mature leaves. Stipules 10-12mm long by 3-4mm wide. Large ovate leaves. Flowers 11-13cm. Petals brick red outside & rich purple inside. Neat corona filaments. Sepals shorter than petals. Fruit large ovate, up to 13cm long & 8cm diameter, yellow when ripe. 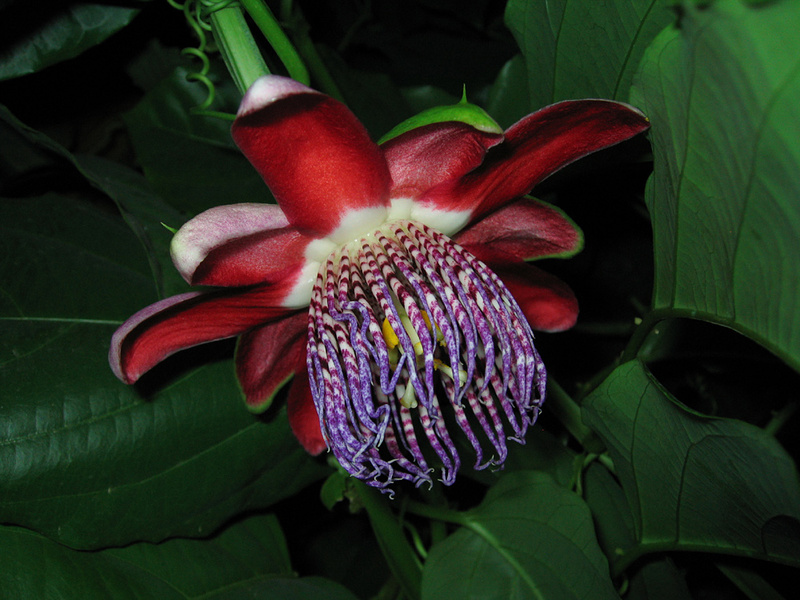 Passiflora quadrangularis A huge vine. Square stemmed. 6 glands on 90% of the leaf petioles. Stipules 2-3.5cm long by 1-2cm wide. Large ovate leaves. Flowers 8-12cm. Very scruffy corona filaments, sepals a little paler than petals inside. Fruit quadrangular (four sided), 20-30 cm long by 10-20 cm wide, pale yellow-green when ripe. The larger P. phoenicea on the left.